The Mic Pre/EQ is a single channel high end, all discrete Class A transformer balanced (input and output) unit that combines a great mic pre and world class EQ in one single rack unit. Separate mic and line inputs can be selected from the front panel "line" switch without changing wires in back. Both inputs are combo XLR/ 1/4 in TRS. High gain of 70dB handles all types of mics from ribbons to dynamics and condensers. Switched phantom enables secure ribbon mic use and 20dB pad switch prevents overload on high output condensers mics. 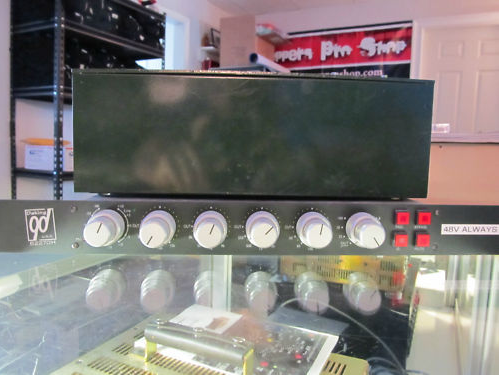 Front panel Phase switch for inverting input phase and large overall mute button and bypass button help the work flow. Geoff Daking's famous Mic Pre EQ inspired by the A Range®* has Four (4) individual EQ bands and Five (5) Stepped frequencies per band with frequencies specially chosen for effective results. This is thought to be some of the best EQ available for tracking, mixing or mastering. Continuously variable EQ boost or cut of 15dB. 25Hz High Pass 6 db/octave filter for getting rid of low end rumble that ruins tracks and 12dB per octave Low Pass filter at 15kHz helps get rid of extreme top end edginess. Separate overall output level control makes up gain lost in extensive EQ cuts. All relay switching with gold bi-furcated contacts for long term life. Steel construction for strength and noise immunity. An outboard "in line" universal power supply remotes the power to keep the noise floor low. want to advertise on auxsend.net?